The story below is a beautiful example of how school grounds can serve as the teacher. In this scenario, the student is left to determine her own solution and formulate her own ideas and thoughts around death. Is reading this story I asked myself, why isn’t death something that is discussed in school? Maybe teachers are hesitant to bring it up? Maybe they assume that death, along with other complex social-emotional topics is more appropriate for outside of school? What works in this story is that it’s actually the soil (and presumably the micro and macro organisms that live in it) that does the teaching. This allows the teacher to guide the students as they struggle with finding the answer that they are looking for. Along the way, the students think like a scientist and moved through the process of discovery - from investigation to data collection to reflection. Thank you to Sue Humphries for sharing this very moving story - you are an inspiration! Please reference the Social Emotional Well-Being section of the International School ground Month Activity Guide, which includes activities that center around empathy and collaboration. If you are interested in submitting a story like this about how you utilize your grounds for social-emotional or other types of learning, please submit your story here. 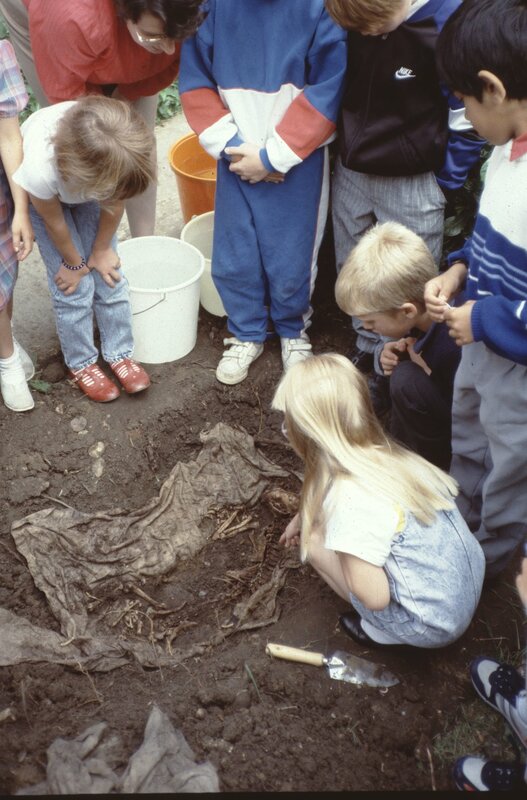 We often buried dead animals in the school garden. The children brought in cats, mice, hamsters and guinea pigs. The idea was to wrap them in a clean cloth, bury them in the soil and dig them up two seasons later, after soft tissue had decayed. The bones were cleaned in a solution of one part bleach, two parts water. After two hours, the bones were removed, and the system was repeated. The result of this killed off the bacteria. Then the children mounted or reassembled the bones. Emma, age 7, brought in a stoat which had been killed by her neighbor’s cat. She buried it with her friends and I helped her wrap in an old bedsheet, we placed a stick marker on it. Two terms later, she went out to dig it up, but could not find the marker, even though she remembered where we had buried it. She meticulously dug over the plot, but she refused to believe that the corpse had gone. After an hour of digging, she went back to where she started and re-dug the plot. I told her that the bones had probably been discovered by an animal. She was adamant that she had not seen the ground disturbed and dug across the whole area again. During this time, the children had gone into school and I tried to persuade her to join her friends in the classroom. I didn’t want to upset her and kept suggesting that another animal had benefited from the bones. Whilst I admired her persistence, I recognized she was missing lessons and was now covered in dirt. By 11 o’clock, I had to intervene, I could not let this child continue to dig. I said “look, I really admire your efforts, but we are not going to find the bones”. The only choice I had was to visit the butcher and inquire after an animal which had just been shot. The next week I arrived in school with a pheasant and convinced Emma that it was road kill. However, she resolutely refused to bury the pheasant in the same ground that we had buried the stoat. Despite her initial reluctance, we found a suitable place to bury the pheasant and six months later, we dug it up. The point of the story is this; children should not first meet death at the loss of a loved one, instead they should meet death heuristically at arms-length. Death is a natural process and a condition of being born. In learning from animals who have died, we respect the lifespan of these animals and help eliminate some of the fear of death. 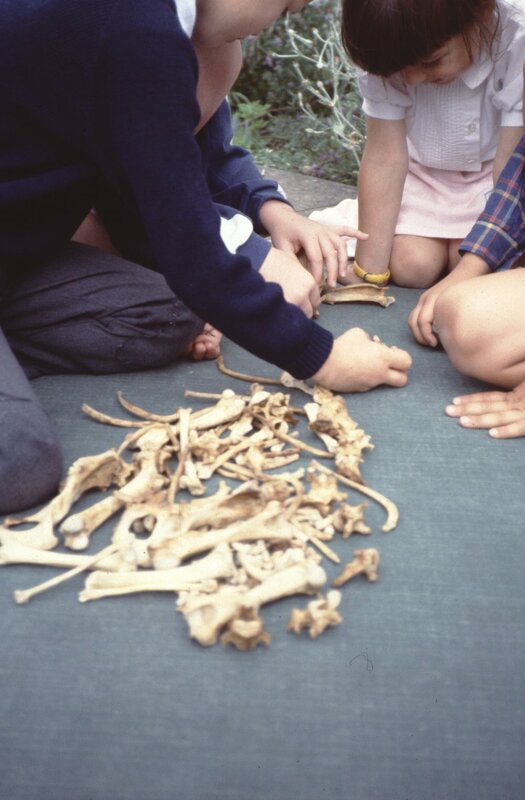 The story and photos above were contributed by Sue Humphries, co-founder of the Coombes School and a pioneer in what has become known as the Coombes Approach to integrating experiential and outdoor education into schools. We are very excited to present the 2018 International School Grounds Month Activity Guide. This new publication is an expanded version of the school ground Activity Guide we have been producing over the last few years. It is designed to help schools use their grounds to the fullest during the month of May for International School Grounds Month and year round! The guides are appropriate for ages 3-18 and are full of cross-curricular activities that enhance and promote play, learning, health, outdoor connections, and community. 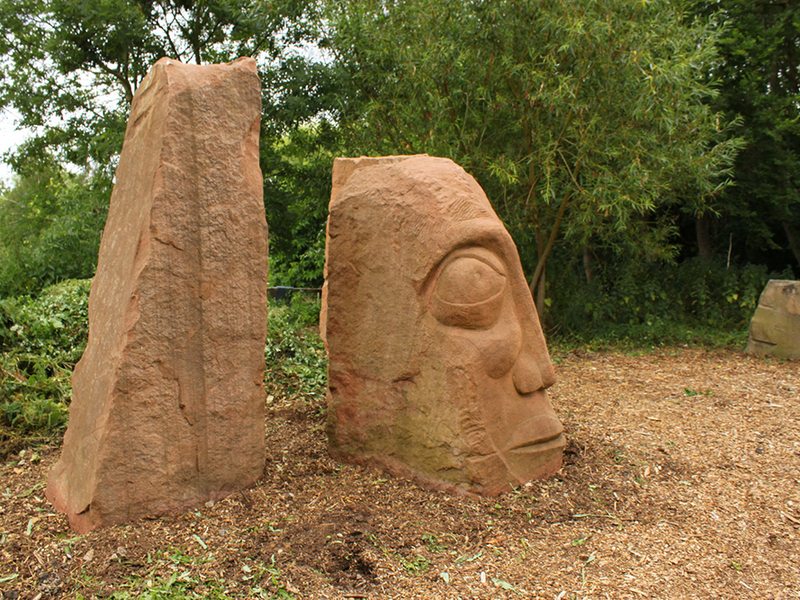 They also contain great background information on the school grounds movement, the benefits of taking children outside, and how we are working to shift the norm of how school grounds are designed and used. We would like to extend a heartfelt thank you to all of our authors who contributed this year and in the past. The Activity Guides would not have been possible without their fantastic written contributions and the generosity of their organizations in sharing their work. We are grateful for the time and energy they put into their submissions and for their efforts to support this movement. With our colleagues at Green Schoolyards America, we also produced a 2018 edition of the companion book, the Living Schoolyard Activity Guide. Together, the two Guides now include a total of 235 activities written by 187 organizations in 27 countries. (Did you know you had that many like-minded colleagues? It’s amazing!) All of the activities in both Guides are intended for use anywhere in the world, so we encourage you and your community to share the links for both of these free books! The map above shows the fantastic geographic diversity of the author-organizations that contributed ideas to this publication series. Organizations that contributed to the International School Grounds Month Activity Guide are shown with red markers. Organizations that participated in the Living Schoolyard Activity Guide are shown with yellow markers. On September 4-6, 2017, 130 landscape architects, designers, educators, school principals, local representatives, and scientists from around the world gathered in Berlin. Representing 21 countries from around the world and numerous educational systems, all were united by one goal: transforming standard schoolyards into a diverse array of landscapes for playing, moving and learning! Conference participants were immersed in a wide variety of learning experiences. On Day One, lectures provided international perspectives on the importance of well-designed open spaces in educational institutions. Specific topics included schoolyard plans created by undergraduate students in Denver, USA and Japan; the very first attempts of designing outdoor playgrounds in China; alternative educational concepts of natural and environmental schools in Sweden; and innovative educational concepts in Germany. Presenters discussed the need to rethink and design learning spaces in a completely different way, not only indoors but especially outside. Excursions across Berlin gave the participants first­‐hand experience in Berlin’s innovative schoolyards. They were able to witness directly and concretely how only outdoor areas are capable of providing children and youth with direct contact to the natural environment. Natural phenomena, weather and climate, animals and plants, and natural elements such as water, earth, and air were experienced together with the children, and understood as part of an "Education for Sustainable Development". On the last day of the conference, participants joined together with pupils of the Otto-Wels Primary School to transform the schoolyard with 12 artistic workshops, including creating mosaics, wicker igloos, stone and tree carvings, painting, and building balancing structures. These crafts brought to life a design developed with intensive participation of the school community and and provided a wonderful sense of achievement, and connection on which to end the conference. It made evident how creativity, teamwork, pleasure, fun and mutual support enabled people of different cultures to reach a common goal that everyone could be proud of: changing together the "Schoolyard Living Space" positively, child-­‐friendly, ecological and sustainable. Overall the conference was a great success. The new ideas and connections made through the lectures, workshops, excursions, and other events provided an impetus for further learning and action to all participants and their home institutions and organizations. We hope that the excitement it generated will encourage imitation across Berlin, Germany, and around the world! For a detailed list of speakers, topics, schools visited, and workshop activities, download the full conference report (right). Why do children need Green School Grounds? In the video, seven of ISGA's Leadership Council members give their personal answer to this question and speak about why Green School Grounds—living landscapes—are important for children's play. The Green Grounds for Health and Learning conference was a great success! The 220 participants from 16 different countries around the world took part in a wide variety of lectures, seminars and practical sessions, both indoors and outdoors. Second grade students at Sekolah Alam Nurul Islam spent the night at Kwaru Beach to observe the sunset and sunrise processes. Fourth grade students at Sekolah Alam Nurul Islam traveled by train from Jogja to Solo. Along the way, students learned about social phenomena around them. These students in Yogyakarta, Indonesia took a field trip - read what they learned! Fifth grade students in Indonesia wanted more fruit trees so they worked together on a creative strategy to fund their project. ISGA Leadership Council member Julie Mountain was invited to represent the International School Grounds Alliance at an early years conference in Bucharest, Romania. We'll be updating our resources booklet again this year and we'd love to hear what you'll be up to in your school grounds during that month. Lone Pine Elementary in Bloomfield Hills, Michigan - in conjunction with their PYP IB Unit Express Yourself - spent time outside during International School Grounds Month. Prospect Learning Center and Jefferson Academy grow pizzas! A school based in Washington DC tells us what they were up to during International School Grounds month. Play Learning Life is thrilled to be supporting International School Grounds Month and we have had a very busy May so far, celebrating the diversity and potential of school grounds with schools and early years settings throughout in the UK. The village of Siankhor in the Shigar valley, sits on the road to Askoli, the starting point to treks in Pakistan's Karakorum mountain range. It is home to the Abruzzi Higher Secondary School.